1967: My first live performance w/ an audience of 9 neighborhood kids. My big hit that hot summer afternoon was The Gilligan's Island Theme Song. 1972: Began writing songs after being influenced by the Great 70's Songwriter David Gates. 1973: Decided to learn the guitar to accompany my songs, after meeting Joe Donohoe who charmed all the girls with his singing and playing. 1974: Formed the acoustic duo SUNRISE with singer/songwriter Roger Beasley and we played private parties and anywhere we could. 1977: Recorded my first record, "Brand New Love" , and hand delivered copies to a string of radio stations through out the Southeast, and actually received airplay on a number of them. 1977: Made my first television appearance on THE COUNTRY BOY EDDIE SHOW, a Local Music Morning Show in Birmingham. 1977: Toured the Southeast as a warm up act for Elvis Impersonator Tony McGil, playing Saenger Theaters and Municipal Auditoriums. 1978: Signed a contract with KING RECORDS and recorded my second single, "Rockin' In My Chevy", in Nashville and released it Nationwide. It did fairly well, but Disco Music was beginning to take hold and I didn't have my boogie shoes back then. 1978: Toured a string of Skating Rinks to support my single and signed my first autographs. 1978: Landed my first radio job at WFTW in Fort Walton Beach, FL and gained a huge following for my trivia show called "Journey Through The Night" and was even allowed to play my own records on the air. 1980: Riding high on the success of my radio show I released my third single, "Teen Lover" on my own label. The 45-RPM sold pretty well in the local record stores. 1981: Landed my second radio job at WNVY in Pensacola, FL and developed a Fan Club inter-mixing my Radio and Music Career. 1982: Recorded three songs at Prestige Productions in Birmingham using The Fort Walton Beach Award Winning Vocalist, Jackie Hammic as background vocals on the song "Just Friends". 1982: Released my fourth single "Hypnotized" including "Just Friends" on the flip side. The record received a lot of airplay along the Gulf Coast. 1983: Won an Honorable Mention in THE MUSIC CITY SONG FEST for "Love You All Week", the third song in that 1982 recording session. 1984: The first of the Bracken Sessions, I recorded three songs with producer Ty Bracken including "Share Your Woman With Me", for future releases. 1985: The creative and silly Answering Machine messages I had been producing for about a year begin to gain a huge following forcing me to put an extra phone line in, just to be able to make calls. 1985: Landed my third radio job at WXBM in Pensacola, FL. 1986: The Name KATTLINE was established for my phone line which by this time was receiving hundreds of calls a day, just to hear my message. 1986: Several radio station morning and afternoon shows were calling KATTLINE, and local newspapers ran several stories on the KATTLINE Phenomenon, making me into somewhat of a local celebrity. 1986: I went into the studio with Producer Ty Bracken to cut two new songs so I could release an album while riding high on this KATTLINE thing. 1986: Faked my death as a publicity stunt on KATTLINE, Then Released my first album, "Nine Lives" by coming back to life with a big Promotional campaign including appearances at skating rinks and record stores. 1986: The album skyrocketed in sales locally to the point, it became the clicky thing to have a copy of "Nine Lives". 1986: Got fired from WXBM because management felt I was to Rock-N-Roll. 1987: Made my second television appearance on the local music show of he time, HAILEY'S LIGHTING SOUND SHOW to support the album. The appearance induced another wave of major sales for "Nine Lives" with the help of my first Music Video "Look At Me". 1988: Began THE UNCHARTED ZONE on KATTLINE to try to help other local artist get exposure for their albums. 1988: Went back to work for WXBM when new management came in. 1988: Returned to the studio with Producer Ty Bracken to begin work on a follow-up album to "Nine Lives". 1990: Landed a job at the very popular radio station ROCK 104 and took my overnight show to #1. 1990: While working at ROCK 104, I became acquainted with Tommy Robinetti one of the morning show guys on the # 1 morning show on the Gulf Coast, and began doing very popular character voices on his show. 1991: I Cut back to part time at ROCK 104 to work full time at KISS-FM in Fort Walton Beach, FL, but I continued to do character voices for Tommy's Morning show. 1991: Began working full time at WXBM again and started doing creative traffic reports part time for WCOA and Q100 while remaining part time at ROCK 104 and KISS-FM. For several months there I was on the air at five different radio stations at once. 1992: I cut back on all my jobs except WXBM so I could focus on my overnight request show that became known as RADIO JUKEBOX and became the highest rated overnight show in the history of Gulf Coast FM Radio. 1993: I released the single "Love Kills" and was authorized to play it on the air and began receiving very heavy request for it on my show RADIO JUKEBOX. 1993: I shot a Music Video for "Love Kills" featuring my Radio friends Tommy Robinetti, who was at ARROW 100 by this time, and WXBM's Marty White and Linda Lawrence as extras. 1993: Released my second album "Curious" including the single "Love Kills" and promoted it heavy, with appearances with the Salvation Army at a local mall. 1994: Once again I wanted to included other local artist into my success, so I started THE UNCHARTED ZONE on my radio show and it's popularity skyrocketed, until new management cancelled all local music on the station, so I quit. 1995: Landed a job at the Fort Walton Beach Radio station 98 SURF, but I hated it, So I left there too. 1996: Began THE UNCHARTED ZONE on television, which was received quite well by other local artist and sponsors, and continues to be very popular to this day. 1996: Released the music video for "Those Nites" on the very famous split screen episode of THE UNCHARTED ZONE. 1997: Released the single and music video "Vagabond" as a tribute to the Famous Pensacola Teen Hang-Out of the 50's. 1998: Released the music video for the song "Soul" featuring TOMMY ROBINETTI as the devil trying to get me to sign on the dotted line. 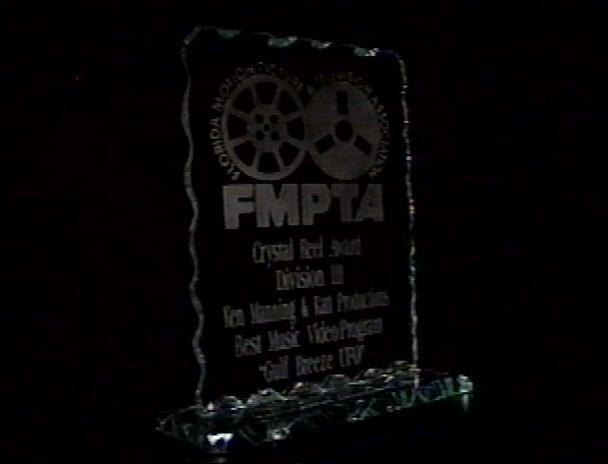 1998: Won a "Crystal Reel Award" from The Florida Motion Picture & Television Association as Producer of the Music Video "Gulf Breeze UFO by Local Songwriter Ken Manning. 1998: Released a music video to the classic Christmas song "I'll Be Home For Christmas", featuring clips of my family within, and background vocals by Michele Carnley. 1999: Released the video "Baby I'm-A Want You" as a tribute to my songwriting idol David Gates of the 70's pop group Bread, and it went on to become the #2 most requested local music video along the Gulf Coast. 2000: Performed at The Pensacola Interstate Fair while having the show shot with the UZ Camera. This was my first live performance in years. 2001: Created UZ Spinoff, "The Weekly UZ Top 10 Countdown Show" in the fall, adding beautiful VJ's TIFFANIE GARD and ASHTON SHANE and interviewer MIKE ROYCROFT who has written for many local publications. With the new format changes The Uncharted Zone popularity skyrocketed. 2002: Won a "Bronze Award" from The Florida Motion Picture & Television Association as Producer of the Music Video "Santa's Gone Hawaiian". 2003: Recorded and Released The Song "This Friend Of Mine" Written By The Grammy Winning Larry Butler who said, "The Tune Was Just My Style". The Music Video debuted Friday Sept. 5, 2003 on The Uncharted Zone Television Show..
2006: Met Mark Gormley and began producing Music Videos for him of his original songs. 2008: The very popular Comedy Punk Band "Vomit Gun" covered My 80's Hit "Share Your Woman With Me" and invited me on stage to perform with them at a show. 2009: Music Videos that I produced for Gulf Coast Singer/Songwriter Mark Gormley developed a huge following on YouTube and helped propel The Uncharted Zone and Me to International fame. 2009: Ketchum Inc., A public relations and marketing agency that specializes in corporate and product positioning and ranks among the largest global public relations agencies, operating in more than 50 countries contacted me to produce a Music Video Sponsored by Frito-Lay's new product, Cheetos Giant. The Video features Tommy Robinetti and Myself introducing the Mark Gormley Music Video, "Sing Me Your Song"
2009: Publicis Modem, a global digital advertising agency network contacted Me to create a project for General Mills Fruit Gushers. Katt Productions was ask to write a song called, "Love Is A Gush" and produce a Music Video in the UZ Style with an Introduction from Phil Thomas Katt & Tommy Robinetti. Pensacola Singer Ken Manning was hired to star in the music video that required many costume changes. The Music video concept was also tweaked into an animated version released on the Beware The Gush site with undersea animated versions of Phil Thomas Katt, Tommy Robinetti and Ken Manning. 2009: The G4 Network's "Attack of the Show" did a great segment on the show featuring Phil Thomas Katt & Mark Gormley. They also featured an array of other UZ Artist as well, including Ken Manning, Crystal Miller and Southern Breeze. 2009: G4's "Web Soup" did a story featuring "Weird Al" Yankovic parodying Mark Gormley and an MTV show called "DJ & The Fro" featured footage from UZ. 2009: Then came the bands from out of town who wanted me to produce them a Music Video and be on The Uncharted Zone. Included was Cruiserweight from Austin Texas, Downtown Brown from Detroit Michigan, and another great band from Detroit called The Hard Lessons. The same week UZ debuted The Hard Lessons music video the band had another track from their CD included in the soundtrack of a Grey's Anatomy episode.